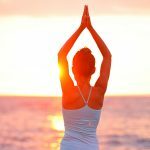 Meditation Yoga woman meditating at beach sunset or sunrise relaxing in yoga pose. Serene relaxed female yoga instructor in calm nature sea scene. From Big Island, Hawaii, USA. Yog helps to reduce depression and keep you healthy and fit.